Adding some pink to our house of blue! That's right! We are having a baby girl! Quite a shock after 5 little boys to actually be getting a girl. I was really stressed out wondering what baby was going to be so I talked Hubby into letting me schedule an elective gender ultrasound this week so I didn't have to wait another 3 weeks for my anatomy scan. We took all of the kids with us. Jason wanted a girl because he said he had too many little brothers, and Jakey wanted another boy. The younger 3 don't care either way lol. The ultrasound tech started the scan and showed the boys the babies head and tummy and then she started looking for the gender. She passed over it a few times and from those glimpses I was pretty sure it was a girl but was waiting for her to stop and confirm it. She said, "So, did you guys do something different this time?!" and I just turned and grinned at Hubby and he asked, "It's a girl?" She showed us the gender shot and it was clearly NOT a boy! 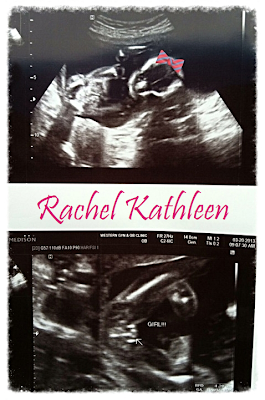 Hubby kept asking if she was really sure and her and I both assured him that it was definitely a girl. She congratulated us and gave us a few pictures and off we went happy and excited. It feels so surreal! I'm actually having a baby girl! I want to go shopping and start making things. I pulled out my old baby clothes that I've been saving all these years, which are in surprisingly good condition for being almost 30 years old. I'm getting them washed up now, and it'll be so fun to see my little girl wearing clothes I wore as a baby. I'm hoping she looks like I did as a baby, with tons of dark thick hair.